Question: Is this normal? : The Best Lotion isn't Lotion... It's Oil! Anyways, it is so good for the human body. It's good for hair, skin, stress relief, premature aging, heart disease, weight loss and many, many more things. Personally, I sometimes use it instead of butter (especially on toast, popcorn or in my brownies), but the most common thing I use it for is my skin! I of course don't use the same jar in the kitchen as I use in the bathroom. I forgot about this trick, so lately I've been using lotion and wondering why I've never used body lotion in the past. It wasn't until my Grandpa was visiting that I recalled the trick. My grandpa, my mom and I were all sitting in the kitchen and he was talking about how good coconut oil is for the body and how he has started using it in his food. My mom's response was that it was very good for us, but there is one benefit that he was overlooking. Then, she took a spoon, scooped out some oil and rubbed it into her hands. Needless to say, my grandpa was a bit thrown off. But that was when I realized why I was all of the sudden using body lotion. 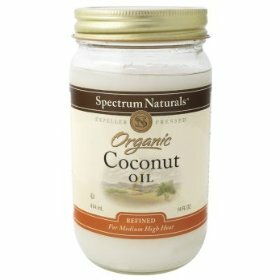 Coconut oil is better! It moisturizes, but doesn't clog the skin's pores. 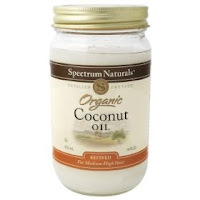 Tips: When the coconut oil is warm, it is quite easy to rub on. However, I keep it on the window sill and since it's snowing outside, it's hard. Hard and difficult to rub in. So... I put it on right after my hot shower, while the shower is still a bit steamy, and right before I dry off. It melts quickly and rubs right in.